When she met Aschi, her now husband, he had stories of traveling with horses all over Australia. Combined with her dreams of vanlife and his love of adventure, they decided to pursue the idea of a house on wheels. We bought it one year after we got married. It's got an old-fashioned diesel engine. It's 5.50 meters long and 2.60 meters high, very compact and easy to drive and it can park anywhere. It's very comfortable to live in. We searched a long time in Switzerland for a suitable van and didn't find anything. One evening, when we were on page 17 of an online marketplace website, we saw an ad for our current van. We liked the couple selling the van as soon as we met them. The van had good vibes, some rust, four wheels, a steering wheel and a comfortable toilet. It was everything we needed. The rest we had to fix, but the price was right. We couldn't believe we made this deal 30 minutes from our home. What have you done to make it your own? We did a lot of work on our van. We overhauled the entire engine block. We made a wooden cabinet and sofa with our own open design layout. We also added new cushion covers, replaced the indoor panels with jute fabric and installed a new floor. We replaced the gas system with LPG and added a 100W solar panel. We worked on the van body by replacing rusty parts with new panels, and we gave our van a good spray painting with 2K color. We are still making adjustments to it. I grew up in the big city of Tehran in Iran. I was a city girl, living in a flat, driving with millions of other people in the same streets and waiting hours and hours in the same traffic jam. Basically I did what everybody else did. Was there one particular moment that you knew you wanted to live in a van? I grew up in Iran during the time of revolution and war. Because of some strange rules, for many years traveling and living in a van was forbidden, so people didn't do it. The traveling culture was forgotten. But I always talked about it with my dad. I told him that one day I'm going to live in a caravan. I moved to Switzerland five years ago in 2011. There, I met Aschi, my dream man from the Swiss Alps. He was different than the other men I had met; he was wise, clever and sensible. He was traveling around the world, and during one of his recent travels, he was on a horseback riding trip in Australia. For three years and with five horses, he followed old stock routes from Melbourne to Cooktown. I was fascinated by all of his stories, and we decided to travel and live the way we wanted. 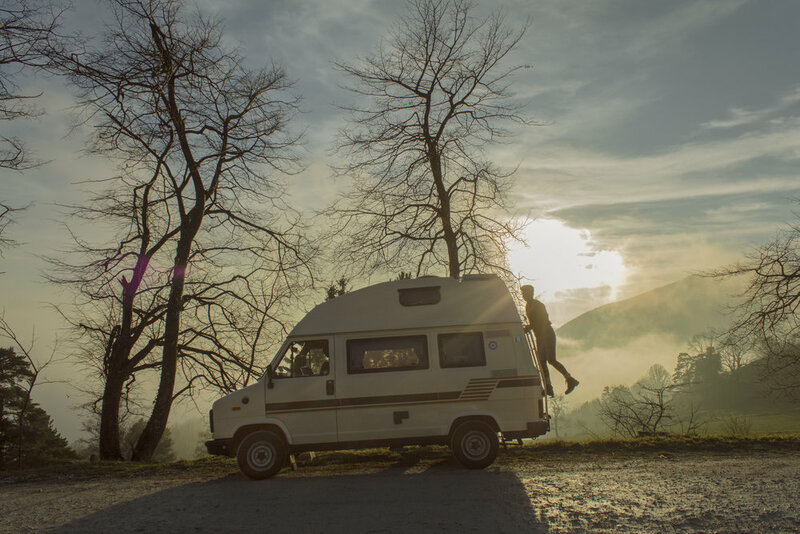 How long have you been living in the van? We have been living this way for three years. But we have been living and working full time in our van for the past four months. How are you funding this lifestyle? My husband and I are filmmakers and photographers. Our job is made easier by our mobile lifestyle. We run a film company, and our base is in Switzerland. There we have a film studio, a workshop and a little flat. We rent out the flat when we are on the road and we come back to our studio when we have to. All we need for our mobile office is the Internet, our laptops and our cameras. I also make handmade jewelry, such as bracelets, necklaces and earrings. I sell them at markets and in my online shop. Where have you been in your travels? We have been in our van to Switzerland, Germany, France, Spain, Portugal, Italy, Croatia, Bosnia, Montenegro, Albania and Greece. Currently, we are on Crete Island. Has there been a moment that’s made you question this lifestyle? So far, no. We love this lifestyle. What's the biggest reward from living this way? The biggest reward is the simplicity of life. We don't need that many things to live and survive. The backpack full of junk is gone. Has your relationship changed with each other at all? Not at all. We love each other very much. Is there anything you wish you would have known before you started? Our long-term plan is to live in a tiny house but also keep the van. We are planning on building a container home, or what we like to call "a clever house"—a house filled with innovations. All photos credit to Asudeh Immer.